If you are in the mood for an old-fashioned thriller, Gaslight may be just the ticket. The story is best known from the 1944 movie based on it directed by George Cukor and starring Ingrid Bergman, Charles Boyer and Joseph Cotton. The British production of Patrick Hamilton’s original 1938 play now running at the Ed Mirvish Theatre is handsomely designed, straightforwardly directed and well acted with outstanding performances from Flora Montgomery as a woman being driven mad by her husband and Ian McElhinney as a the retired detective who wants to save her. Set in a drawing room with a single entrance, the action becomes so tense, you jump at every knock on the door. 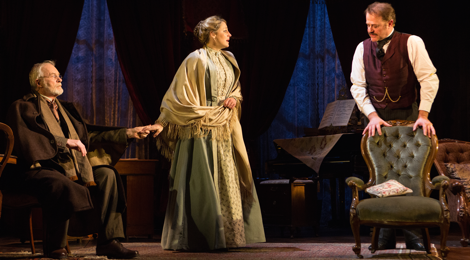 Gaslight is one of the few thrillers of the 1930s that is still regularly performed. One reason is that it taps into a primal fear that people have of losing one’s independence on entering into marriage. Hamilton sets the play in the mid-Victorian period where that loss of independence was very real for a married woman for whom the “obey” in “love, honour and obey” was taken quite literally by both husband and wife. What happens when a husband abuses the bond of marriage is the subject of Hamilton’s play that feels like Wilkie Collins’s sensation novel The Woman in White (1859) as seen through Ibsen’s A Doll’s House (1879). David Woodhead’s set is a deliberately overstuffed Victorian parlour. There is only one entrance to the room, a large double door surmounted by grotesque bat-like wooden ornamentation, that makes the room look more like an old display case for curios than a liveable room. The play opens with a marvellous silent scene where Bella Manningham (Flora Montgomery), who thinks her husband Jack (Owen Teale) is sleeping, tiptoes about the room and speaks to the maid Elizabeth (Victoria Lennox) in whispers careful not to wake him. Montgomery already gives us the feeling through her movements and glances in these first moments that Bella actually fears waking Jack. When he does wake we see why this is true. In A Doll’s House Ibsen shows that Torvald treats his wife as if she were an ignorant little child and, until she sees how independent her schoolfriend Kristine is, she acts like a child to please him. Hamilton’s portrayal of the relation between Bella and Jack is much worse. Jack displays the same patronizing condescension as Ibsen’s Torvald except that his attitude conveys wariness and distrust. For her part, Bella does act the part of a child as does Ibsen’s Nora, but the implication is that she is also not well. Indeed, Jack doesn’t hesitate to mention that Bella’s mother went mad and that Bella has been showing signs of heading in that same direction. He constantly quizzes her about items in the household that have gone missing and she becomes increasingly agitated when she can’t remember what has happened to them. Unlike Torvald, Jack deliberately humiliates Bella. When a picture has gone missing from the wall, he asks in the two maids, Elizabeth and Nancy (Emily Head), to prove that only Bella could know where the missing picture has gone. Jack also freely flirts with Nancy, the younger maid, in front of his wife with the clear suggestion that Nancy’s youth and healthiness make her more desirable. 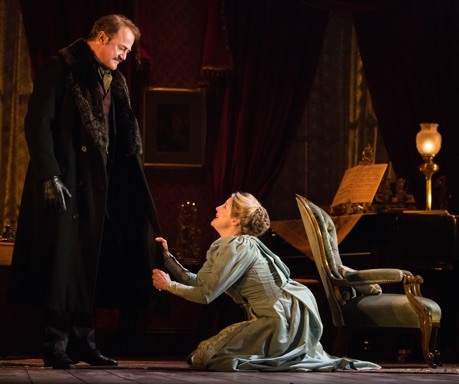 Thus, the typical Victorian male’s unconscious patriarchal attitude of superiority that Ibsen found oppressive enough, Hamilton has turned into a conscious oppression of a wife by her husband. It is this conscious abuse of old-fashioned patriarchal privilege that gives Hamilton’s thriller its continued relevance. What changes Gaslight into a thriller rather than a modern tragedy like A Doll’s House is both the depiction of the husband not just as a follower of convention but as an outright villain and the presence of at least two people who actively try to rescue Bella from her situation. One is the older maid Elizabeth. The other is a retired police detective Sergeant Rough (Ian McElhinney), who has heard of Bella’s situation from Nancy’s policeman boyfriend and has spoken directly with Elizabeth. He is also familiar with Jack and with the house Bella and Jack live in from an earlier unsolved case. When Jack goes out, as he always does of an evening, Sergeant Rough enters and gives Bella an alternative version of what is happening in her life with Jack for which, however, he has only supposition but no proof. He is convinced that Bella is not going mad as Jack would like her to believe, but that Jack is intentionally trying to drive Bella mad for reasons that have nothing to do with her but with the house they live in. One of the best effects that director David Gilmore achieves is an increase rather than decrease in the tension we feel after Rough’s departure. Theoretically, with a saviour presenting himself on her doorstep reassuring her she is not mad, Bella should feel relived and able to regain her strength to confront her husband. Hamilton, however, has portrayed Rough in such a way that confidence is not what he immediately inspires. First of all, he is a complete stranger who for bizarre reasons has been spying on Jack and the house for some time. Second, Rough presents himself, especially in McElhinney’s wonderfully eccentric performance, as as a highly peculiar man who finds comfort primarily in a a shot of whisky and tends to so much circumlocution one fears he may never get to the point. Third, the tale he gives Bella of why she is not going mad is so fantastical that to go mad as her mother did seems a simpler and more logical explanation than Rough’s. Thus, when Rough leaves, we have the terrible fear that Bella is now caught between two explanations of what she is experiencing, neither of which bodes well. Flora Montgomery gives a truly superb performance. Given that Bella is distraught for nearly the entire length of the play, Montgomery carefully shades Bella’s attitude from simple anxiety to fear, horror and severe depression. Montgomery also makes important use os Bella’s few moments of happiness to give us a glimpse of what her character must have been like before she came under the malign influence of Jack. A second exceptional performance comes from Ian McElhinney as Rough. Rough is the only source of comedy in the tense atmosphere of the play, but McElhinney ensures that Rough’s humour is also slightly unnerving. He makes Rough’s habit of approaching a topic from about as far away as possible both an amusing quirk but also an unsettling sign that the ex-policeman may be a bit loony himself. In fact, he makes Rough’s obsession with his old case seem not unlike Jack’s obsession with tormenting Bella. McElhinney puts both Bella and the audience in the uncomfortable position for much of the action of having to accept everything this strange old man says on trust alone. Perhaps David Gilmore and Owen Teale are trying to have Teale present the villain Jack in a different way than the definitive performance of Charles Boyer in the 1944 film, but Teale’s performance is not as subtle as either Montgomery’s or McElhinney’s. As Jack, Boyer was careful to couch his manipulation of Bella in soothing tones as if he were truly sorrowful about her supposed decline in mental health. Teale maintains a harsh exasperated tone throughout as if he is barely able to contain his impatience. This makes the character less interesting and doesn’t allow us to question his intent as much as we should. Victoria Lennox and Emily Head are excellent as the two contrasting maids. Lennox gives the voice of the older maid Elizabeth an air of authority, calming when she speaks with Bella, edgy when she speaks with Jack. Head’s Nancy barely contains her insolence and it comes as no surprise that she is ready to become mistress of the house as soon as it is convenient. Gaslight is still an old-fashioned play in style, partly because Hamilton is trying to recreate the stiffer social conventions of an earlier age. Yet, the story still remains a canny modernization of the Bluebeard tale with its emphasis on how little a woman can know about her husband. Besides this, Hamilton’s depiction of psychological manipulation as merely an extension of patriarchal privilege is frighteningly relevant. Mirvish Productions have reduced the size of the Er Mirvish Theatre from 2,300 seats to 1,384 to create a greater feeling of intimacy. The small size is much better but still too large since the actors all have to be miked. Yet, given that the Shaw Festival has never staged Gaslight, even though it is firmly in its mandate, and with its excision of mysteries is unlikely to do so, the present production will certainly be the starriest and most lavish you will see on stage. The performances of Montgomery or McElhinney are not to be missed.